I think this scene stands out to people because it's the first time we see Draco as something more than a 2-D villian--and that fact smacks Harry in the face, too. I'm not a Draco Grrrrl, but this book is the first time I've really felt for him as a person (well, as a character, anyway). I don't think seeing him cry made him weak--I think it made him HUMAN. I was irked when his first reaction at seeing Harry was to attack with an Unforgivable Curse (which reinforced he IS bad), but then was tugged at the heart again to see him dying on the floor a moment later. J.K.R. totally manipulated me through that whole part--but in a good way! I'm not a Draco grrrl either (evidenced by the lack of illos of him from me) but I loved the growth in his character in this book. And I found Harry's obession with him really amusing. 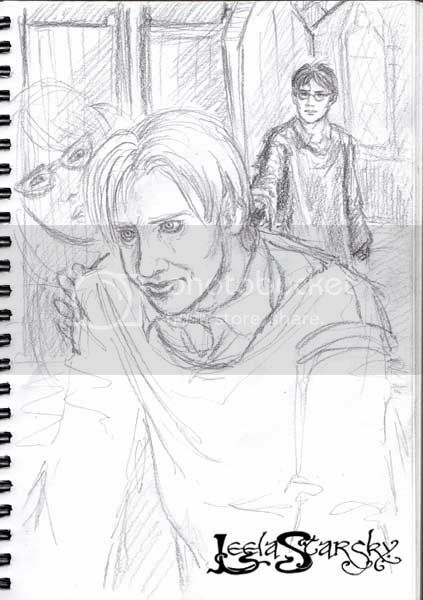 I've been planning to illo the scene with him and Harry on the train, so finding myself drawing this sort of caught me by surprise.